Follow these tips to draw a realistic bear in 5 simple steps. So you want to draw a bear. Learning to do so can be a really useful and engaging activity, even if you don't necessarily want to use images of bears in your digital artwork or illustrations straight away. 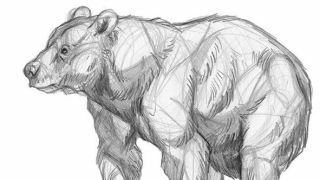 Learning how to draw animals – like bears – will provide plenty of inspiration that can be incorporated into your artwork and can also help you with your anatomy work. For more on animal drawings, check out our tutorials on how to draw a horse and how to draw a cat. In this tutorial, I start by working quickly and using broad, light pencil marks to find the animal's gesture. This is especially key when drawing from life, where animals move about as you draw. So, get your best pencils at the ready as I reveal how to draw a bear in five simple steps. Keep your arm loose and move quickly – this is the messy stage! I begin with a light sketch – I don't want to make any solid marks or bold lines yet, I'm just finding the shapes of the animal's form. I will break this initial sketch into a wire skeleton and shapes to start. This is the foundation of my study. As I begin to build up my drawing, I'll draw through forms. This means that I'm not worried about forms covering each other, but rather I begin to see through them. This helps to keep the drawing fluid and keeps me aware of where the forms are overlapping in space. I'm also looking for landmarks, such as the scapula and knee caps, to help me locate the anatomy of the animal as it develops on the paper. This is where my experience in drawing real-life animals frequently helps. I'm able to locate and find a variety of different muscle groups based on both my previous studies and memory. However, I'm always sure to really look at my subject so as not to miss out on what's actually in front of me. Locating the joints and major muscle groups can also help with fur placement and rendering later on. Now that I've got a solid blueprint in place, I can begin to add in some quick values. Here, I'm imagining a light source above the bear. If you need a refresher on values, see our post: everything you need to know about tonal values. This stage is where heavier lead comes in handy. I tend to alternate from HB and B lead, but you can use what you’re comfortable with. I'll draw with these heavier pencils to nail in those lines, and flesh out the forms of the muscle groups, too. Now I can begin to suggest a few details here and there. Every animal has a different set of proportions and small details that make that species unique, and every species has unique individuals. It's important to pay attention and really see what's there. I'm also interested in adding in markings or any other distinguishing textures or features in this step.